This image provided by NASA's Hubble Space Telescope May 4, 2006 shows a second red spot, smaller, emerging on Jupiter. For the first time in history, astronomers witnessed the birth of a new red spot on the giant planet, which is a half a billion miles away. The storm is roughly one-half the diameter of its bigger and legendary cousin, the Great Red Spot. This image was taken with Hubble's Advanced Camera for Surveys on April 25, 2006. Jupiter has a rocky core that is more than twice as large as previously thought, according to computer calculations by UC Berkeley and University of Arizona scientists. Burkhard Militzer, an assistant professor of astronomy and earth and planetary science at Cal, simulated conditions inside the planet on the scale of individual hydrogen and helium atoms. The simulation predicted the properties of hydrogen and helium for temperature, density and pressure at the surface, all the way to the planet's center. The technique is often used to study semi-conductors, according to a UC Berkeley statement on the discovery. Militzer's partner, William B. Hubbard, from the University of Arizona, used the data to build the new model for Jupiter's interior. A comparison of the model with the planet's current known mass, radius, surface temperature, gravity and equatorial bulge implies that Jupiter's core is an Earth-like rock 14 to 18 times the mass of Earth, or about one-twentieth of Jupiter's total mass, Militzer said. Previous models predicted a much smaller core of only 7 Earth masses, or no core at all. 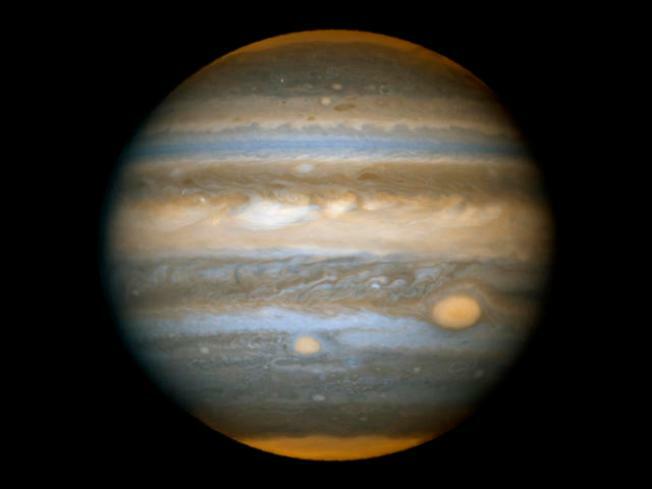 Jupiter, like many planets its size already discovered throughout the galaxy, is believed to be a failed star. Most of the planet's mass is made up of gas. The results were published Nov. 20 in Astrophysical Journal Letters. The simulation suggests that the core is made of layers of metals, rocks and ices of methane, ammonia and water, while above it is an atmosphere of mostly hydrogen and helium. At the center of the rocky core is probably a metallic ball of iron and nickel, just like Earth's core, scientists said. "Our simulations show there is a big rocky object in the center surrounded by an ice layer and hardly any ice elsewhere in the planet," Militzer said. "This is a very different result for the interior structure of Jupiter than other recent models, which predict a relatively small or hardly any core and a mixture of ices throughout the atmosphere." "Basically, Jupiter's interior resembles that of Saturn, with a Neptune or Uranus at the center," he said. Neptune and Uranus have been called "ice giants" because they also appear to have a rocky core surrounded by icy hydrogen and helium, but without the gas envelope of Jupiter and Saturn. "This new calculation by Burkhard removes a lot of the old uncertainties of the 19-year-old model we have had until now," Hubbard said. "The new thermodynamic model is a more precise physical description of what's going on inside Jupiter." Scientists said the large, rocky core implies that as Jupiter and other giant gas planets formed 4.5 billion years ago, they grew through the collision of small rocks. The rocks formed cores that captured a huge atmosphere of hydrogen and helium. "According to the core accretion model, as the original planetary nebula cooled, planetesimals collided and stuck together in a runaway effect that formed planet cores," Militzer said. "If true, this implies that the planets have large cores, which is what the simulation predicts. It is more difficult to make a planet with a small core." In order to match the observed gravity of Jupiter, Militzer's simulation also predicts that different parts of Jupiter's interior rotate at different rates. Jupiter can be thought of as a series of concentric cylinders rotating around the planet's spin axis, with the outer cylinders - the equatorial regions - rotating faster than the inner cylinders. This is identical to the sun's rotation, Militzer said. Militzer modeled Jupiter's interior as a collection of 110 hydrogen and nine helium atoms in a tiny cube that is replicated throughout the planet, a common approximation in "density functional theory." The ratio of hydrogen to helium atoms approximates the ratio measured on the surface of Jupiter. Each simulation took from one to seven days on parallel computing clusters. Based on this simulation, under the high pressure and temperature deep within the planet, hydrogen changes from a molecular to a metallic state, which provides good electrical conductivity and gives rise to Jupiter's magnetic field. This transition happens gradually, contrary to earlier models that predict a sharp transition. The new model of Jupiter predicts that most of the ices are concentrated in the outer layer of the core, while only a small amount is mixed in the hydrogen-helium gas envelope that contains 95 percent of the planet's mass. The "planetary ices" in the envelope amount to about four Earth masses, or 1 percent of Jupiter's mass, Militzer said. "The simulation was in pretty good agreement with what the Galileo probe measured" when the NASA spacecraft descended through Jupiter's atmosphere in 1995, Hubbard said. Militzer plans to use the new model to simulate other planets' interiors, and to investigate the implications for the formation of planets outside our solar system. Future data from NASA's Juno mission, to be launched in 2011, orbit Jupiter by 2016 and measure the planet's magnetic field and gravity, will provide a check on Militzer's predictions. Hubbard is one of the mission's co-investigators. The National Aeronautics and Space Administration and the National Science Foundation supported the research.